It wasn’t until I was no longer a youngster that I came around to truly appreciating the magic of Robert Duvall on screen. That in part is probably due to his playing roles that were not always of the action oriented variety I wanted to watch as a kid discovering movies. For me he was the lawyer in the background for the mob, a victim that needed rescuing in Breakout or Frank Burns in MASH. Then I started to see him in films like The Killer Elite, True Grit, The Outfit and Apocalypse Now and I started to change my tune. An Oscar for his role as a burned out country singer in Tender Mercies was a winner in our home so from then on he’s always been on my radar when appearing in a movie of any sort. Past or present. 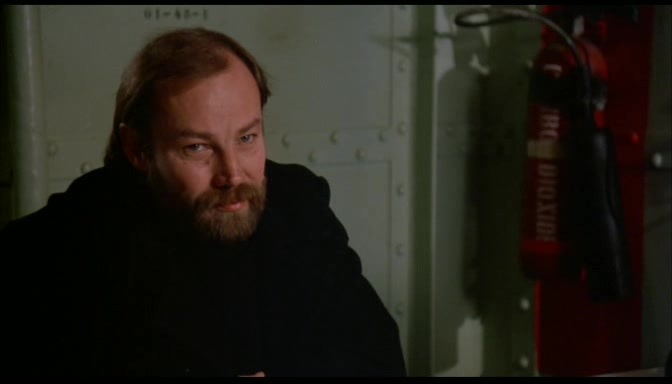 All this brings us to his appearance opposite Klaus Maria Brandauer in what might be looked upon as his oddest characterization to date. That of a criminal with a dapper look to him as if he’s dressed like Barney Fife and off to the Mayberry Saturday night dance with Thelma Lou on his arm. Tweed suit and bow tie included. Of course he’s also a raving psychotic with the air of a southern gentleman about him. Our tale of piracy on the high seas takes place in the years following WW2. 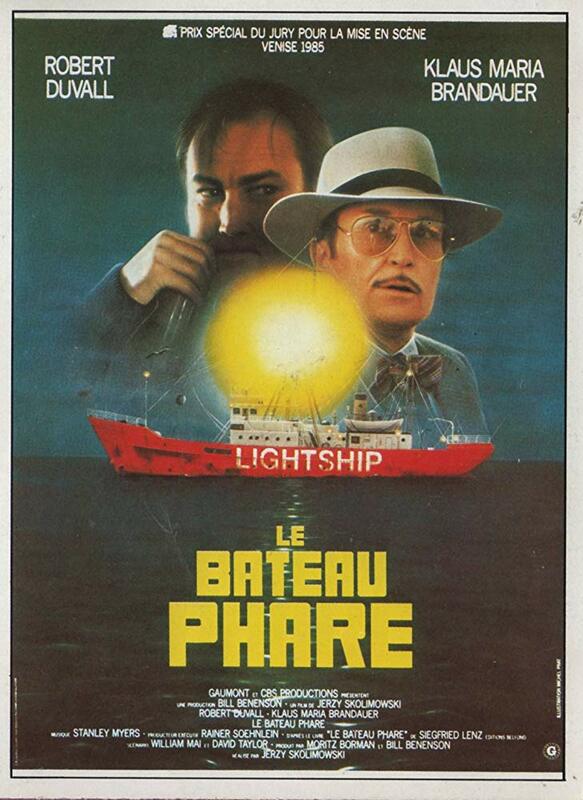 Klaus is the Captain of a Lightship stationed off Norfolk, Virginia. For this tour his young teenage son with a major chip on his shoulder accompanies him. This role is enacted by Michael Lyndon aka Michal Skolimowski aka son of the film’s director, Jerzy Skolimowski. There’s a history here between Klaus and his on screen son that will come to the forefront of our story as it nears it’s conclusion. 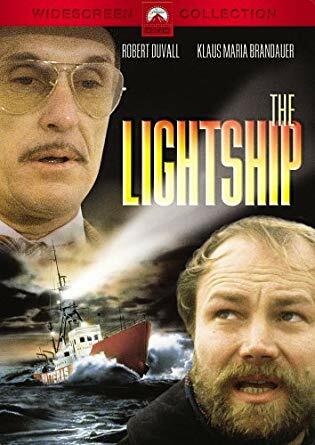 When a small craft is floating adrift past the Lightship, Brandauer has his crew send a boat to rescue the distress call which brings Duvall, William Forsythe and Arliss Howard aboard. From the onset, the air is thick with tension. Duvall is clearly the ring leader and father figure of the three who keeps his temper in check. Not the same for his associates. Howard plays it mean while Forsythe is childlike and unpredictable. 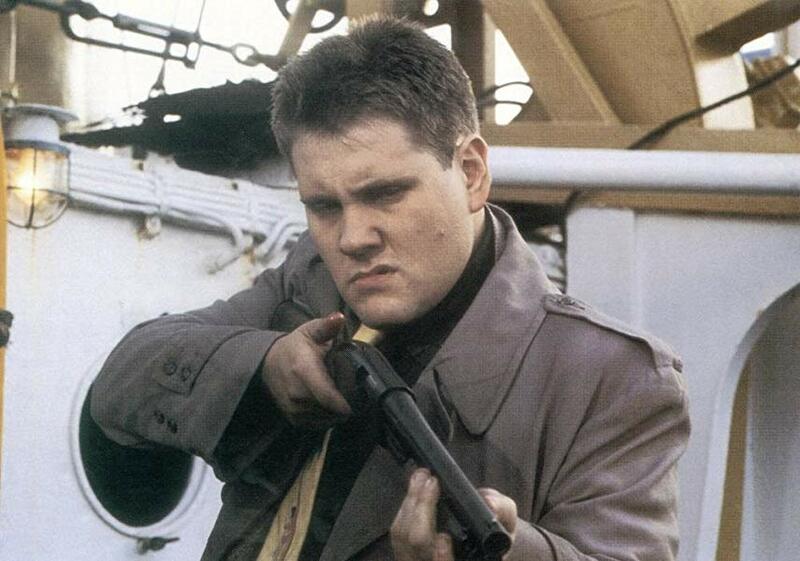 Brandauer’s crew which includes the familiar faces of Tom Bower, Robert Costanzo and Badja Djola are on edge and when a confrontation occurs between Howard and the crew, guns are drawn. 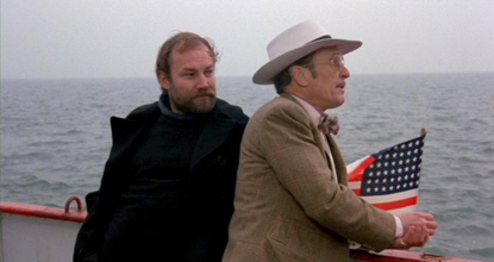 Duvall and his pals are on the run and awaiting to be picked up by an unseen contact on the water. With no boat Duvall figures on laying over on the Lightship till the fog lifts. Brandauer wants no trouble and orders his men to co-operate pending Duvall’s departure. The crew want nothing greater than to go on the attack as does the young boy who sees his Father as a coward bringing credibility to the rumors that he was just that during his time in the war as a naval commander. While Brandauer and Duvall will spar verbally for a good portion of the film, neither leader will be able to hold his men in check which will lead to violence and bloodshed by the time the credits roll at the 88 minute mark. This proved to be a first time viewing for me and one that left me wondering if there was a greater film left on the cutting room floor. I did like the film and that’s mainly due to Duvall and Brandauer’s scenes together. They prove to be the film’s highlights. While Duvall is playing against type with his Dapper Dan persona he makes it work and captures both Brandauer and the viewer with his charm. On the flip side I wasn’t overly excited with the way Howard and Forsythe played their parts. Especially Forsythe who comes off as an overgrown child with murder on his mind. I wouldn’t be surprised to hear that he looked towards the Lenny character from Of Mice and Men as a guiding light. I don’t mind Forsythe as an actor but unless I change my thinking upon a rewatch, I don’t like what he was striving for here. Klaus is an actor I really know very little about as the majority of his film work belongs to foreign cinema. By now I should have seen his turn in Mephisto but shamefully admit I haven’t. I suspect his most well known role here in North America might be as Bond villain, Maximilian Largo in Never Say Never Again. Yes I do consider that a Bond film no matter what the official count is. Others may know him from his role in the best picture of 1985, Out of Africa. I’d be curious to hear your thoughts on this Duvall characterization if you have seen it and the film as a whole. I’m not quite sure how readily available it is for viewing but it was released to DVD years ago by Paramount if you’re going to attempt to hunt it down as I did recently. Definitely never heard of this one before Mike! Sounds very interesting. 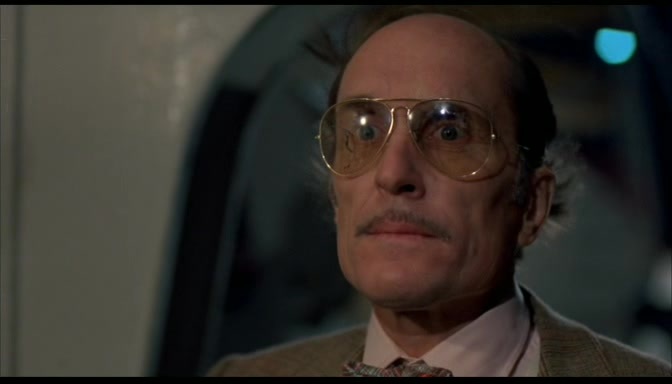 Loves me some Duvall though he looks vastly different in the photos, gaunt almost!. One of his I keep meaning to see is Coppola’s The Rain People. Have you seen it? Any good? Only thing I believe I’ve seen Klaus in is White Fang which he was excellent in. A film I really have a soft spot for. Worth a look for Mr. Duvall. Saw The Rain People as a kid and it was one of the reasons I didn’t pay much attention to him. Recall very little about it but have Countdown lined up for a viewing from 1969 that also cast James Caan as well. Need to see that version of White Fang. Forgot he was in that as well. I haven’t seen this one yet, but Jerzy Skolimowski is an interesting filmmaker. I thought The Shout and Moonlighting were fascinating thrillers. I really need to track this one down. Truthfully I’m not familiar with those titles so a bit of research is on order and Shout has already caught my eye. Thanks for the lead. Hope you like this one.